What many believe to be the two best teams in the NFL, the New England Patriots and the Atlanta Falcons, are descending in Houston for this Sunday's Super Bowl LI. And what many believe to be the best cellist in the world, Yo-Yo Ma, is coming to Houston's Jones Hall for a special concert this Saturday night, Feb. 4, 2017, to perform Dvorak's cello concerto with our great Houston Symphony Orchestra. What a blessing that my wife and I will be in attendance in Jones Hall to hear the legendary virtuoso cellist, Yo-Yo Ma performing my favorite cello concerto-an epic work by Antonin Dvorak. Also, on the program, in this special added concert, is Gershwin's "An American In Paris", a repeat piece that we heard at last Saturday night's concert, maybe in tribute to Yo-Yo Ma being born in Paris to Chinese parents who were living in Paris at the time. 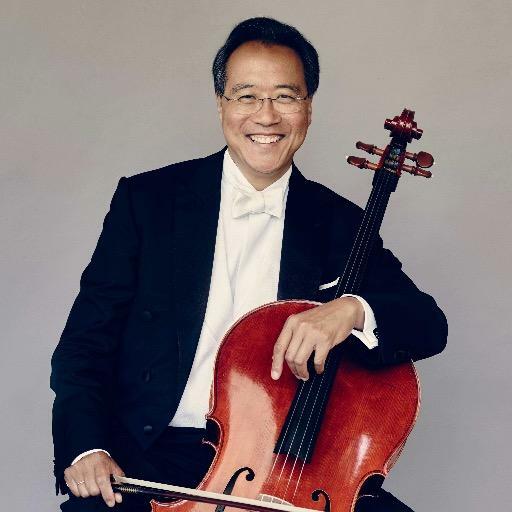 This from the Houston Symphony website: "Andrés [Orozco-Estrada] welcomes superstar cellist Yo-Yo Ma back to the Houston Symphony for Dvorák’s Cello Concerto. One of the world’s most beloved musicians, Yo-Yo Ma has entranced audiences since his performance for Presidents Eisenhower and Kennedy at age seven. After an epic solo concert at the 2015 BBC Proms, one reviewer reflected, “Without doubt, we were in the presence of a great musician, and a great man. One to file in the concerts of a lifetime” (BBC Music Magazine)." From Y0-Yo Ma's website: "Yo-Yo Ma was born in 1955 to Chinese parents living in Paris. He began to study the cello with his father at age four and soon came with his family to New York, where he spent most of his formative years. Later, his principal teacher was Leonard Rose at the Juilliard School." "He has received numerous awards, including the Avery Fisher Prize (1978), the Glenn Gould Prize (1999), the National Medal of the Arts (2001), the Dan David Prize (2006), the Leonie Sonning Music Prize (2006), the World Economic Forum’s Crystal Award (2008), the Presidential Medal of Freedom (2010), the Polar Music Prize (2012) and the Vilcek Prize in Contemporary Music (2013)." "He has performed for eight American presidents, most recently at the invitation of President Obama on the occasion of the 56th Inaugural Ceremony." The Dvorak cello concerto is scored in B minor with 3 movements: 1. Allegro, 2. Adagio ma non troppo, 3. Allegro moderato-Andante-Allegro vivo. While this is not on the program, check out Yo-Yo Ma performing the beautiful "The Swan", the 13th [of 14 movements] from Camille Saint-Saens Carnival of the Animals. Now to hear the piece that the fetching Mrs. B and I will be hearing Saturday night [Super Bowl eve], check out this 1983 recording of the late great Russian cellist, Mstislav Rostropovich, soloist in the Dvorak Cello Concerto. The pensive, serene adagio movement starts at 16:23 and the exciting final [3rd] movement starts at 28:32. Please turn up the volume and enjoy this epic piece of music. Welcome to Super Bowl City Houston, Yo-Yo Ma!